Located on the Powell Divide, 2 km SE of the smaller of the two lakes at the head of Chusan Creek. This peak is a rocky triangular peak. 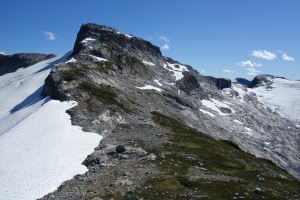 Its gentle NE ridge extends out 4 km and eventually connects with another peak. Its NW ridge connects with Julian Peak. Its south ridge connects wtih the main watershed divide, dividing the Daniels R from Chusan Creek. Name Notes: Named after Chusan Creek, which drains it to the northwest, into Toba Inlet. Chusan is an island in China, captured by the British in 1840 during the First Opium war.